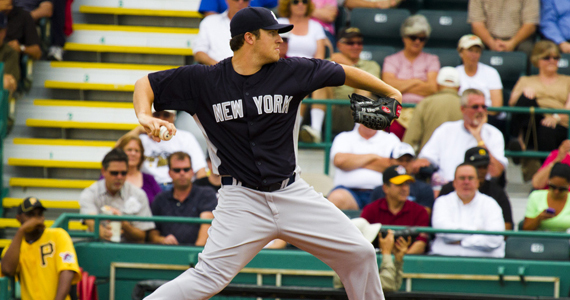 Who Should be the Yankees 5th Starter? Jobu answers the biggest question from Yankees Spring Training. When pitchers and catchers first reported to Legends Field in Tampa, Florida, the New York Yankees roster and every day lineups were pretty much already set. There probably won’t be many surprises when the team heads north come April. The only real battle this spring is between Freddy García and Phil Hughes (even with the Pettitte signing, as he won’t be available until possibly May). The winner will take the ball every five days as the fifth member of the starting rotation, and the loser will probably be the long man in the bullpen (although that role could be different, depending on who wins the rotation slot). Who’s it gonna be? Here’s what I think. Unfortunately for Phil Hughes, he can’t exactly rely on his play from last season to win him the rotation spot. In fact, he was pretty damn awful last year. He showed up to camp overweight and throwing his fastball in the high 80s. Despite reassurances that he just needed to get into shape, Hughes’ fastball and command never really returned. He still opened the year in the starting rotation, which was a huge mistake. Hughes made just three stars in April, going 0-1 with a 13.94 ERA, allowing 19 hits and 16 runs in just 10.1 innings. It was awful, and it landed Hughes on the DL with what many assumed to be a merciful fake injury (official explanation was arm fatigue). Hughes eventually came back in July, but he was shaky at best, finishing the year with a 5.79 ERA and a spot in the playoff bullpen. Despite Hughes’ struggles in 2011, the general feeling is that the job, although billed as an open competition, is his to lose. It’s very hard to argue with this. 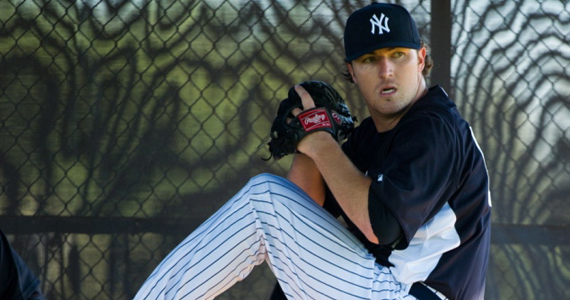 Back in 2004, the Yankees drafted Hughes in the first round because they thought he had the potential to be the next great home-grown Yankees ace. They have been very patient with Hughes, putting up with many growing pains along the way. They continue to put their faith in Hughes because they still believe in him. Maybe they don’t think he’s an ace anymore, but they feel he can contribute. In 2009, he showed how nasty he could be out of the bullpen, securing the 8th inning role and solidifying a very shaky relief corps. It is no coincidence that the Yankees went on to win the World Series that year. In 2010, Hughes used a stellar first half (11-2, 3.65 ERA, 1.178 WHIP, 8.1 K/9) to build some pretty impressive season totals. His 18 wins were second on the team, and, despite his second half struggles, Phil seemed to have finally arrived as a starter in the Bronx. The Yankees know Hughes can be dominant. They also know he can get off-track and sometimes be terrible. It’s kind of hard to believe that Hughes is still only 25-years-old because he’s one of the longer tenured Yankees (not counting the remaining core two). Because he has been here so long, many in the organization (and the stands) feel like it’s time for him to put up or shut up. I think everyone except Freddy García probably wants Hughes to take the fifth spot and pitch like the kid they thought they were getting in the draft, but have only seen inklings of the last five seasons. This brings us to Freddy García. If we were handing out the 2012 fifth starter spot based on last year’s performance, there’s no way Freddy would lose it. We all chuckled a little bit when the Yankees picked him up as a free agent last spring (maybe it was because they also signed Bartolo Colón, Eric Chavez, and several other players who would have been great pickups in 2003). We thought, if he even made the team, he’d get pounded for a month or two before his arm fell off and he had to retire. Instead, Freddy ended up surpassing all expectations. He finished the year with a 12-8 record and a 3.62 ERA, proving that you can be a successful major league pitcher while throwing 85-89 MPH (as long as the rest of your repertoire includes nothing but filthy junk balls). 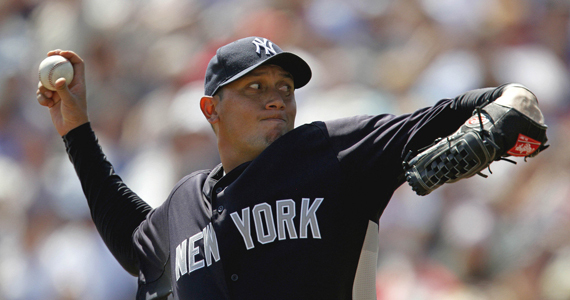 Along with Bartolo Colón, García helped solidify a much maligned and questioned Yankees starting rotation. There’s no down-playing just how great García was for the Yankees in 2011. Unfortunately, assuming Hughes doesn’t literally crap his pants on the mound this Spring (it could happen, I’ve seen it! ), Freddy faces an uphill battle. Another thing to consider is how suited each contender is for the bullpen in the event that they don’t win the rotation spot. As I mentioned before, we all saw what kind of a force Hughes could be in 2009. Pitching only one or two innings at a time allowed him to put a little extra oomph on every pitch, and he flourished. From June of that season on (when he joined the bullpen) Hughes went 5-1 with a 1.40 ERA, a 0.857 WHIP and 65Ks in 51.1 innings pitched (11.4 K/9). Those numbers are no joke. We know that, if Hughes is forced into the bullpen by García come April, it will definitely strengthen an already potent bullpen, and will help ease the pain of missing Joba Chamberlain until August. What can Freddy do out of the bullpen? This is an interesting question, because nobody really knows the answer to that. In his thirteen year career, García has come out of the bullpen exactly twice. Once was last April when the Yankees were trying to get him some in-game action as he waited for his turn to finally come up in the rotation (because of off-days, fifth starters are normally skipped a couple of times at the beginning of the season). The other one was as a 23-year-old in 2000 with the Mariners, when Freddy was a hard throwing ace-in-the-making. He’s not going to be the same type of bullpen arm that Hughes could potentially be. He doesn’t throw in the mid-90s like Hughes showed he could do in relief (frankly, I’m not sure Hughes could anymore either), but that doesn’t mean he couldn’t be useful out of the pen. Freddy has developed into the type of pitcher that can basically pitch whenever you ask him to, and it doesn’t mess with his ability to be prepared or effective. Because of that ability, he would be the perfect long reliever. When the Yankees are winning or losing by a lot, Girardi could stick García in there for three-to-five innings as needed. The Yankees have been trying to fill this role for a long time with such garbage as Sergio Mitre and Chad Gaudin, so if García could adjust to it, it would help the team immensely. If not, the Yankees could always ask Freddy to allow them to trade him somewhere. OK, let’s get to what I promised here, and that’s my opinion on who should get the job. Luckily for the Yankees, both of these men have expressed that they want the rotation spot, but are willing to do whatever it takes to help the team win the World Series. That’s a good start. That being said, I think the job should absolutely be Hughes’ to lose this spring. He has come to camp in shape and ready to work, and his velocity has held up fairly well so far this spring. He’s 25-years-old and ready to have his make-or-break season, and so I expect him to get it together and have a year like he did in 2010. I think García will adjust well to the long-relief role, and will most likely see a few starts anyway throughout the year (injuries, double-headers, etc). As they say, you can never have enough pitching. Note: This article was written before the Andy Pettitte signing, but I didn’t change it because the consensus is, as I said before, that Andy won’t be ready for opening day (not by a long shot), which means this is still the main battle going on within the rotation right now. We will definitely revisit this question as the season goes along, and as Andy gets closer and closer to his possible return.